Like many movie going fans, we love James Bond films. From the cool gadgets to the smooth cars you really have a lot to enjoy. It is also quite applicable to our industry with many of our clients requesting Bond type devices and options that we offer such as bomb protection, gun ports, and electric door handles. Recently. the series has taken it up a notch with the addition of Daniel Craig as the new Bond. With the latest installment Spectre (Special Executive for Counter-Intelligence, Terrorism, Revenge and Extortion), Mr. Craig is set to return to the big screen in November 2015. One of the exciting announcements made this month was that Aston Martin will return as the Bondmobile maker with a custom and unique Aston Martin DB10 (see photo above). Aston Martin will handcraft and manufacture a couple of them specifically for the Bond film. We wanted to extend an invitation if you can get your hands on one we would love to armor it for you. We have already armored several Aston Martin models (see here and here) and we believe we have more experience than anyone worldwide protecting the drivers in these Aston Martin models. You could even say we feel a little Bond-like tough when armoring these. 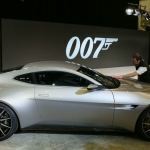 Well if you love James Bond gadgetry and luxury vehicles and have a couple extra thousand to spend, please reach out to us. We love working on bullet proof cars and giving all of our clients peace of mind in any situation. Let us share our craft with you.